15th Century customs and peoples brought to life in all their astonishing variety and beliefs. A fantasy book that creates a world different from our own yet hauntingly familiar. EASTBOURNE, England - July 7, 2015 - PRLog -- Fighting princesses, court intrigue, vicious pirates, starkly different islanders, all come together in a delightful melting pot of a novel, spiced with a touch of almost believable magic. There is masses of fighting, individual and battles, on land and sea, with stalwart soldiers, unerring archers and invisible assassins, all brought to life with devastating touches of humanity and a liberal dose of humour. 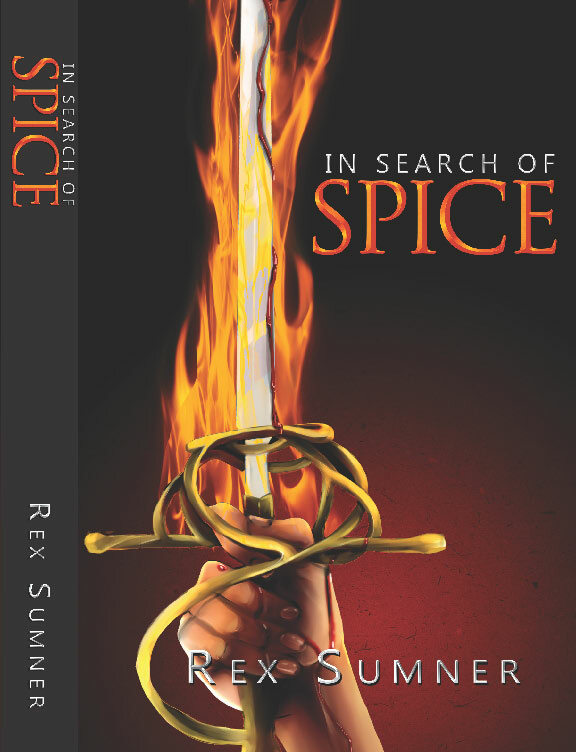 Combine the above with complex inter-personal relationships and affairs, trade and esoteric sailing lore and you revel in In Search of Spice, an historical fantasy novel that will make you laugh out loud before switching to rapt attention as you turn the pages. Harrhein is a country reminiscent of Europe - whether Germany, Holland or Britain isn't clear, but will cause you to study the beautifully crafted maps designed by artist Maria Gandolfo who also created the cover. Trade is stifled by the omnipresent warlike neighbours, the Spakka, rather similar to Vikings with interesting views on honour. So King Richard helps fund the building and voyage of a carrack, based on the design of one wrecked on his shores by the Spakka. It sails in search of the fabled land of Hind, reputed to be the source of the exotic spices in demand by his court. This is the story of that voyage, and in particular some of the crew members, not all of whom intended to be aboard. Friendships form across gulfs in social standing and the Harrheinians encounter strange lands and people, with customs exotic and fascinating. Author Rex Sumner assures the reader that these customs exist in a very close form, somewhere in the world, or at least in history. Even the interesting way the Pahippians greet newcomers to their island is based on something very similar happening to the early European explorers in the South Seas. His observations on the different habits of islanders are clearly rooted in actual custom, not least in the varying styles of surfing employed on adjacent islands to say nothing of diet. While educational, the primary purpose is to entertain and this book does that in spades. It is non-stop action, whether a swordsmanship contest or sailing in a storm; desperate battles against cannibals or varying fishing styles with interesting bait; trading in spices and people or discovering new animals which defy belief - to the people of the time. This new world is seen through the eyes of several people of both sexes, showing both the thoughts of the Europeans discovering Asians, and those of the Asians encountering pale people. All peoples are very human and slowly the book reveals more and more on the varying characters of even those with minor roles. For the discerning, there are clues to other stories hidden behind names and titles, which are correct in representing each of the many peoples encountered - even in Harrhein where there are two subsidiary, long conquered kingdoms whose culture still shines through. Enjoy this helter-skelter ride, which is perhaps more reminiscent of Pirates of the Caribbean than Game of Thrones - the author shows a refreshing tendency not to kill off his heroes as soon as you get to like them.